The spine along with the intervertebral discs allow rhythmic motions required by humans to walk, run, swim, and perform other regular movements. 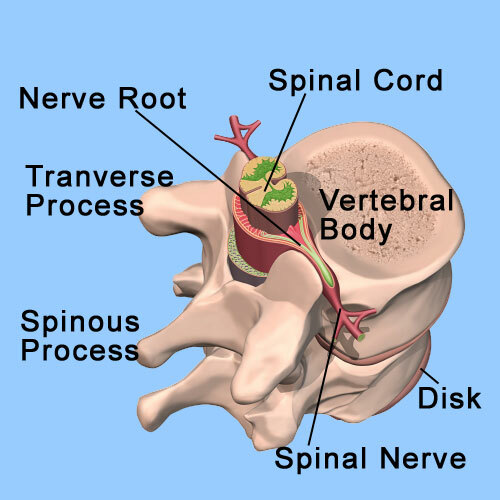 Additionally, the spine provides a bony protection for the spinal cord and exiting nerves. The facet joints, in particular, help to prevent excessive motion, over-twisting or toppling over; these joints stabilize the spine yet preserve the flexibility needed to turn, look around and get around. 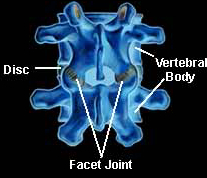 The facet joints, or joints with “small faces” are found at every spinal level (except at the top level) and provide about 20% of the torsional (twisting) stability in the neck and low back. The vertebrae of the chest (thoracic) area are far less mobile and permit a small amount of forward/backward and some side bending, and very little twisting. The facet joints do slide on each other and both sliding surfaces are normally coated moist cartilage (like any other joint in the body) which helps to reduce friction. A small sack or capsule surrounds each facet joint and provides a sticky lubricant for the joint. Each sack has a rich supply of tiny nerve fibers that provide a warning when irritated. The intervertebral discs are also a type of joint in the spine, and are bound together by flexible fibers in several circling bands (annulus fibrosis), like a tough fire hose, that make up the outer portion of the disc. Disc joints can bend and rotate a bit but do not slide as do most body joints. Facet joints are in almost constant motion with the spine and quite commonly simply wear out or become degenerated in many patients. When facet joints become worn or torn the cartilage may become thin or disappear and there may be a reaction of the bone of the joint underneath producing overgrowth of bone spurs and an enlargement of the joints. The joint is then said to have arthritic (literally, joint inflammation-degeneration) changes, or osteoarthritis, that can produce considerable back pain on motion. This condition may also be referred to as “facet joint disease” or “facet joint syndrome“. A protective reflex arrangement occurs when the facets become inflamed causing adjacent muscles that parallel the spine to spasm. Therefore, the inflamed facets create mechanical pain along with powerful and painful muscle spasms. These muscle spasms can often overlap or supersede true facet pain. Facet joint disorders are common causes of recurrent, disabling low back and neck problems, and can cause serious symptoms and disability. Despite radiating pain into the extremities (arms or legs), facet joint problems rarely involve the spinal nerves. Interestingly, with acute lumbar or cervical facet joint inflammation, the symptoms may closely imitate those of a herniated disc, sciatic, a fracture or a torn muscle of the spine. Clearly, such episodes can be very disabling and frightening. The MRI scan is not quite as useful for diagnosing this particular spinal problem, but is extremely helpful when investigating possible disc or nerve problems. An MRI scan is the best test to assess all the different parts of the spinal anatomy. The most definitive diagnosis of facet joint pain can be made by a facet joint injection (or facet joint block), which injects the suspicious facet joints with a small volume of a combination of x-ray contrast material, local anesthetic and cortisone. Relief of the acute or chronic problem during the time of action of this combination of drugs is diagnostic. Treatment options for facet joint pain To break up a cycle of recurring, acute facet joint pain, a number of treatments can be used successfully. Many of these treatments give some or even a lot of temporary relief but all too often, little long-term help. The most important and beneficial treatment often requires life-style changes (weight loss, exercise and/or improved body mechanics). Good posture (maintaining a normal curvature of the spine such as pulling the car seat quite forward or when standing at a sink, putting one foot up on a ledge, bending that knee a bit), support to the low back when seated or riding in a car (particularly in the acute phase). A very useful posture when standing or sitting is the pelvic tilt – where one pinches together the buttocks and rotates forward the lower pelvis – and holding that position for several seconds, done several times per day. The use of anti-inflammatory medication, such as various non-steroidal anti-inflammatory, called NSAID’s (e. g. ibuprofen) and/or low dose tylenol. More lasting relief of the facet joint problem can be obtained cortisone injections (facet injections) or by destroying some of the tiny nerve endings serving the joints. This can be accomplished by freezing or an electrified probe technique (also known as a facet rhizotomy or RF) performed under careful x-ray control. Facet rhizotomy has it’s drawbacks and limitations. In unusually severe and persistent problems, degeneration of the adjoining disc is nearly always present so the segment may require a bone fusion surgery to stop both the associated disc and facet joint problems. Such surgery may be considered radical, and is a last resort for persistent, episodic, severely disabling back pain. Fortunately, for the vast majority of patients, a combination of change in life style, medication and proper exercise and posture will reduce the problem to a manageable level.